9 February 2017 - In the midst of a global poaching crisis, today marks the launch of the most comprehensive Training Guidelines for Field Rangers, providing anti-poaching units with a revolutionary resource to improve conditions and training on the front line. This is the first of its kind and a resource which could save the lives of both humans and wildlife. Over the past decade, more than 1,000 rangers have been killed on duty*, with 80 per cent murdered by poachers and armed militia groups. This tragic loss of life underlines the need for well-trained and well-equipped anti-poaching rangers. The team of experts who developed this resource have over a century of combined experience and are amongst the most respected wildlife rangers in the world. This is the first in a series of guidelines that will be rolled out worldwide by the International Ranger Federation, the Global Tiger Forum, Thin Green Line Foundation, PAMS Foundation and WWF. The illegal wildlife trade is the fourth most lucrative criminal trade and estimated to be worth at least USD $19 billion per year. Poachers targeting iconic species such as elephants, rhinos and tigers are using increasingly sophisticated techniques and violent tactics to fulfil their missions. The deployment of insufficiently trained rangers has at times resulted in the failure of operations, serious injuries and even death. Many rangers still have no insurance today; should they suffer injuries – or even death – they would no longer able to provide for their families. Last year, WWF carried out the first ever Ranger Perception Surveys that were completed by wildlife rangers across Asia and Africa. The results revealed that most rangers had faced a life-threatening situation while on duty, and believe that they are underequipped. Nearly half felt they lacked adequate training to do their jobs safely and effectively. 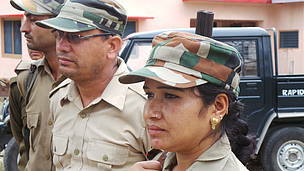 Field ranger basic training is the most important part of the development of field rangers. It prepares them for the actual circumstances that they will encounter during the day-to-day tasks to be performed once employed as field rangers. Field rangers play a critical role in safeguarding the world’s most endangered species. Recent figures revealed around 20,000 elephants are poached every year in Africa. Since Selous Game Reserve became a World Heritage site in 1982, nearly 90% of its elephants have been lost mainly due to poaching. Selous now risks losing its World Heritage status. Across Asia, the 13 tiger ranger countries are working tirelessly to double tiger numbers by 2022 - the illegal wildlife trade is one of the greatest threats with recent progress hanging on a knife edge due to this illicit activity. The Training Guidelines for Field Rangers is the first of a series of guidelines to provide a standard for training field rangers. These guidelines are the result of a collaborative initiative from International Ranger Federation, Global Tiger Forum, PAMS Foundation, WWF, The Thin Green Line Foundation, United For Rangers (UFR), Southern African Wildlife College, International Anti-Poaching Foundation (IAPF), Conservation International, African Parks Network, TRAFFIC, Panthera, Wildlife Trust of India (WTI) and Global Wildlife Conservation (GWC). The guidelines cover the basics of operations and the tactics required for them to successfully carry out anti-poaching operations in the field. The guidelines will help park managers, conservation organisations, government departments and other relevant people in designing the training curriculum for anti-poaching rangers as per their needs. By following these high standards, it will help ensure that anti-poaching training manuals may adequately introduce the concepts and specifics of law enforcement, tracking, teamwork, conservation, first aid and court procedures to the field ranger. PAMS Foundation: PAMS Foundation are increasingly recognized internationally for being pioneers of effective and innovative strategies in wildlife protection. PAMS assists with anti-poaching in 4 African countries and the records show that every area where they have implemented projects to support wildlife protection there have been measurable, usually dramatic, reductions in the levels of poaching.